The Resident Evil games have always been one of my favorite horror series. I’m always more than happy to go back and play any of these games and now the entire main series is at our fingertips in one way or another. Resident Evil Code Veronica X has now been released in HD and this is a game I am legitimately excited for as this was the Resident Evil I had played the least as it saw its original release on the Sega Dreamcast and was later ported over to the Playstation 2 with exclusive content. One thing I remembered about Code Veronica is that it was the hardest Resident Evil I ever played and that hasn’t changed at all in this HD release. Everything that made Resident Evil great in its prime days is still present in this game with the old style controls and menu systems and cheesy voice acting. Resident Evil Code Veronica X has you playing as Claire and Chris Redfield trapped on a secret Umbrella controlled island still looking for each other and trying to take down the evil corporation that can’t seem to stop making everyone’s lives so miserable. Naturally there is a T-Virus outbreak on the island and you have to survive the horror of zombies and other mutated creatures as you search for any kind of escape. This game features some interestingly unique characters such as the Ashford family who helped create the Umbrella Corporation. You will also see some old faces returning or mention of some remembered characters. 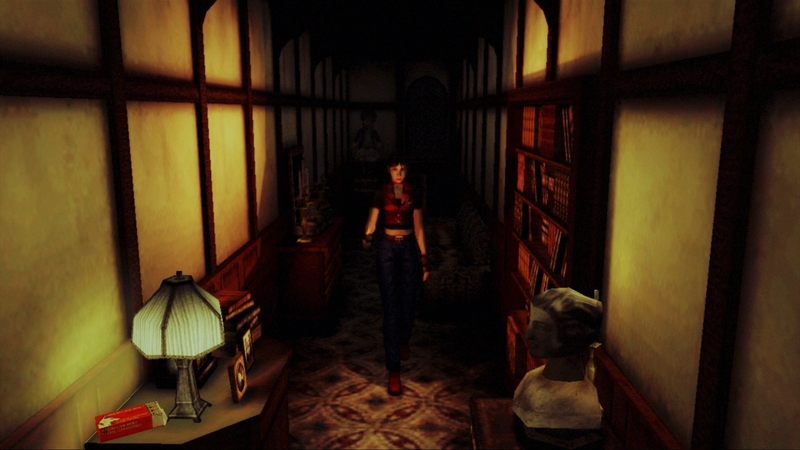 The fear factor is still present in Code Veronica as the dark atmosphere and jump scares are a constant theme throughout the game. The gameplay is a portion of the game that might be lost to newcomers to the series or people who have only played the more recent games. As an old time Resident Evil fan I had no trouble jumping back into the familiar control style and running through the game however the control layout may seem a little stiff to players who have never played a Resident Evil game but it can be said that the controls have been mapped out to an Xbox controller very well and feel genuinely intuitive. It can be easy to lose yourself as pushing up always means you’re walking forward and when you want to turn you can just stand still and hold left or right to watch your character do this awkward walking in place motion to turn. The quick turn feature however did make its way into this game and is probably the most helpful command you could learn. As a veteran Resident Evil player I never really found a moment where the controls didn’t seem responsive and I was able to dodge enemies with relative ease but unfamiliar players may find the controls frustrating and a little dated. With HD in the title of the game you can expect some touch up of the graphics but while playing this game you will always be able to tell that this is an older game. The actual gameplay looks fine and the graphics manage to hold up pretty well. The cut scenes however look super compressed and have a pixilated quality to them which is rather disappointing because this game had one of the best openings to any of the previous Resident Evil games and it’s a shame to see it in a blurry pixilated presentation here. The menus in the game, while they are a small part, are presented in a nice clear and sharp HD format and are probably the most obvious representation of HD in the game. Overall the game manages to look quite good for being as old as it is while only suffering in the cut scenes. The game still looks good enough to be scary and that’s all you can really ask for with a Resident Evil game. Jumping back into Code Veronica reminded me how much fun I still have with the older Resident Evil titles. These games are definitely dated but they do hold a place in survival horror history as they began many of the tropes that are still used today in games such as Dead Space and obviously the newer Resident Evil 5. Code Veronica still manages to capture you enough to drain hours of your day when you sit down to play it. It is still one of the harder games in the franchise and the difficulty can be kind of off putting at times but if you manage to stick through it there is still some genuine fun to be had with Code Veronica. I still love the feeling of cautiously walking from room to room expecting a zombie to pop out of a window or some giant creature to throw itself over a balcony and in your path for escape. While it is not the most masterful port Code Veronica is still a worthy package for survival horror fans. The game could definitely benefit from a lower price as it is not as much of a deal as the other Resident Evil HD release but you still are getting a great game for your dollar. Even though it's an older game just getting a re-release this title could bring new fans into the Resident Evil series and being able to own the entire library is worth having this game available in any format. While it may have some video issues Code Veronica is still a great time and worth looking into. Overall, Resident Evil Code: Veronica X is what every fanboy has been waiting for. It’s almost like someone did an episode of the Simpson’s to make all the other episodes make sense. Not only does it complete the puzzle, it sets the ground work for a new one. This game is a must buy for any fan of Resident Evil, even those who swear it off after 3. To top it of, it looks good, plays good and feels good - a rare quality these days. And, most importantly, it’s way better than its Dreamcast brother. I guess that’s another reason to buy PlayStation 2.